Home » What’s The Best Water Softener For Well Water? Installing a water softener is considered one of the most efficient and cost-effective ways to remove minerals from well water. This guide will help you pick the best water softener for well water. Don’t forget to check out our detailed reviews of the best water softeners for well water you can buy right now. Why Do I Need A Water Softener for Well Water? The well water is pumped out of the ground by a water pump. It is considered VERY HARD water which contains lots of calcium and magnesium. These minerals pass through a home’s plumbing system and leave deposits on pipes, appliances, and dishes. Well water also reacts with soaps, making them less efficient, and creates a soapy residue on bathtubs, storage water heaters, tankless hot water heaters, clothes, hair and skin. In addition, several epidemiological investigations have demonstrated the relationship between risk for cardiovascular disease, growth retardation, reproductive failure, and other health problems and hardness of drinking water or its content of magnesium and calcium. Not only, calcium and magnesium, but other constituents of well water also affect different health aspects. Water softeners can help remove minerals and contaminants in well water and will save you many hours in cleaning and extend the life of your plumbing and appliances. After hardness in well water, iron is the most common water problem dealt with by homeowners with well water. It’s naturally occurring in the soil and is washed into drinking water from rain and surface water run-off that seeps through the ground. Iron in well water can be a real problem and can cause staining of fixtures, sinks, flooring, and also most anything else it comes into contact with. Since it has so many undesirable properties, iron removal is important factor to consider when selecting the best water softener for well water. More water softeners are used to remove iron from well water than any other devices or systems. Many of these installations are successful and consistently remove both hardness and iron. At other installations, intermittent leakage of iron through the softener occurs, but the total water quality improvement is so great that the users are reasonably satisfied. However, in well water filtration system where a softener is removing both iron and hardness, the softener resin life is greatly reduced. Iron will eventually coat and clog the resin matrix and prevent it from working properly. The best water softeners for well water will work well for iron removal but we would recommend an iron filter to treat well water before it passes through the softener system. A water softener will work much better and longer if there is iron treatment before it in the treatment system. Most water softeners on the market are ion exchange systems. In these systems, hardness ions (calcium and magnesium) are exchanged for salt (sodium or potassium) ions. The exchange takes place within the resin tank of the water softener. When well water flows through the tank it comes in contact with small resin beads that are covered with salt ions. As well water flows through the resin beads, hardness ions trade places with salt ions, hence the higher salt content in softened water. As larger volumes of water are softened, the beads become exhausted and contain nothing but hardness ions. The beads are recharged by adding bags of salt to the brine tank. Recharging works the same as softening but in reverse. The hardness ions swap places with the salt ions in the brine tank and excess minerals are rinsed into the wastewater drain. Brine Tank: The brine tank is just what its name suggests, a plastic tank that contains a brine, water saturated with salt. The brine solution is typically made with salt or sodium. However problems may result if you are on a restricted low sodium diet in that some of the sodium is transmitted into the drinking water. Potassium is considered superior and environmentally friendly, albeit a bit more expensive, than salt and does not affect your health, watersheds or the environment or your septic system. Control Valve: The control valve is the traffic cop in your water softener system. It determines when it is time to clean those plastic beads which are now coated with calcium and magnesium. 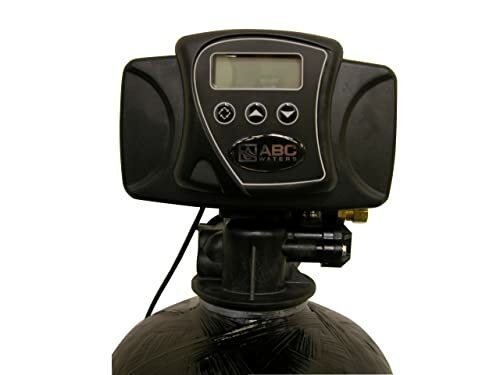 Some of the best water softeners for well water, such as the ABCwaters Fleck 5600sxt 48,000 Water Softener, have the ability to tell you when to add more salt and monitor water usage and anticipate future demand so you don’t run out of soft water. How Does A Water Softener Remove Iron? An iron removal pre-filter, known as a sediment filter, cannot remove dissolved ferrous iron in well water. Dissolved ferrous iron is most commonly removed with a water softener. Manufacturers report that some units are capable of removing up to 10 mg/L, however 2 to 5 mg/L is a more common limit. One of the best water softeners for well water on the market, the Iron Pro 2 Combination Water Softener, is capable of removing about 8 PPM (1 ppm = 1 mg/L), which is the highest number in the industry. A water softener is actually designed to remove hardness minerals like calcium and magnesium. Iron will plug the softener, and must be periodically removed from the softener resin by backwashing. In the case where neither ion exchange nor iron filters are applicable of removing all iron in well water, a whole-house water filter system may be used in combination with great effectiveness. Or simply add a carbon filter can greatly reduce the amount of iron in well water. The ABCwaters Triple Combo Whole House Fleck 5600sxt 48,000 Grain Water Softener System is the best water softener for well water available. This is a complete whole house water softener system that offers an efficient and cost-effective way to treat very hard water like well water. Most customers are satisfied with it and you’ll see many positive reviews on Amazon. 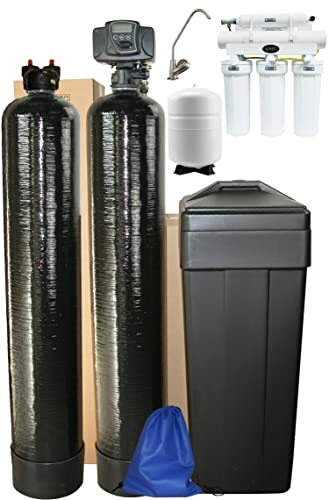 This triple combo package includes a whole house water softener system (ABCwaters built Fleck 5600sxt 48,000 Water Softener), an upflow carbon tank and a 5 stage reverse osmosis drinking water system. The reverse osmosis system will provide purified water that safe to drink. If your family gets drinking water from well, this is a perfect choice. The upflow carbon tank provides efficient filtration without the need to backwash. No backwash means no electricity required, no drain line needed, and no wastewater produced. Greener water filtration and cleaner, safer water is a breeze with our carbon tank filter system. Carbon media is a natural media derived from coconut shells that removes a wide range of contaminants including chlorine and chloramines, pesticides, herbicides, organics, MTBE, and THM. It also removes most other chemicals, tastes and odors, and is an excellent system for general filtration. One of the key features of the Fleck 5600sxt is its digital control valve. Fleck 5600SXT digital control valve provides a top-of-the-line experience with more efficiency and control than mechanical heads. LCD display shows important information and makes user interaction simple. Easy to use interface simplifies programming and makes setting up a breeze! Adjustable cycles allow complete control over the system, allowing you to fine tune each setting to get the most out of your system. Internal Backup maintains the correct time and prevents loss of settings in the event of a power outage. Metered “On-Demand” regeneration reduces water and salt consumption. It also ensures you are never without treated water! Overall, the ABCwaters Triple Combo Whole House Fleck 5600sxt 48,000 Grain Water Softener System is a perfect choice if you’re looking for the best water softener for well water. We’ve found that this complete softener system is much cheaper compared to other systems of the same quality. You can’t go wrong with it. The Aquasana Rhino 500,000 Gallon Whole House Well Water Filter with Salt-Free Softener is one of the best whole house filtration systems on the market. But we’ve found that this system can remove effectively a variety of unwanted minerals, bacteria and algae, and iron from well water. The prefilter cartridge takes away rust and silt particles from well water before it goes into the water softener. The UV filter protects against bacteria and viruses that could be present in well water. The salt-free softener then runs the water through a catalytic media that transforms the calcium and magnesium into inert crystals. 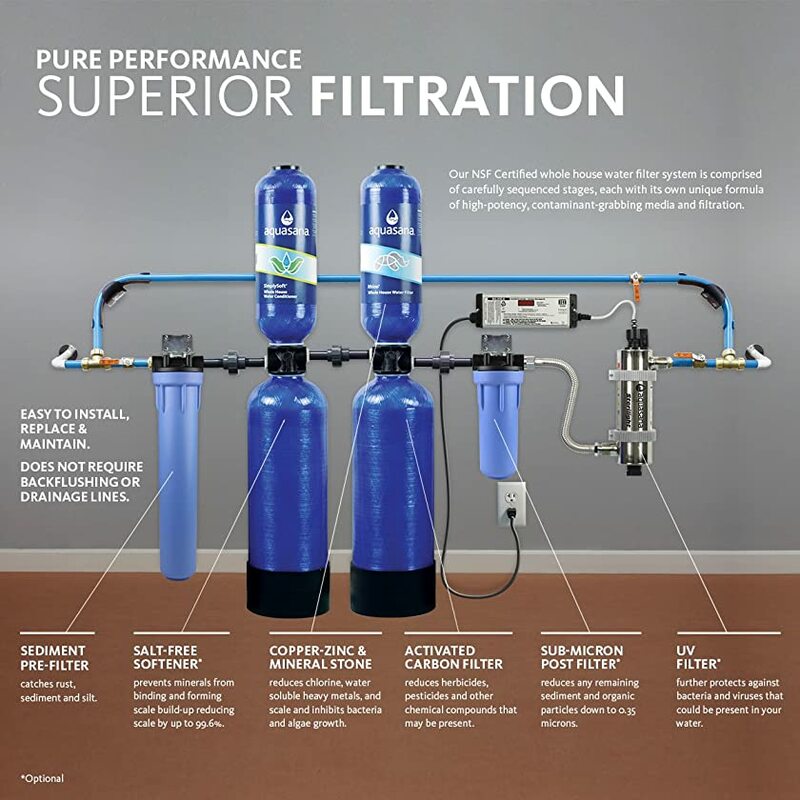 We believe this complete filter system offers one of the best water softeners for well water. 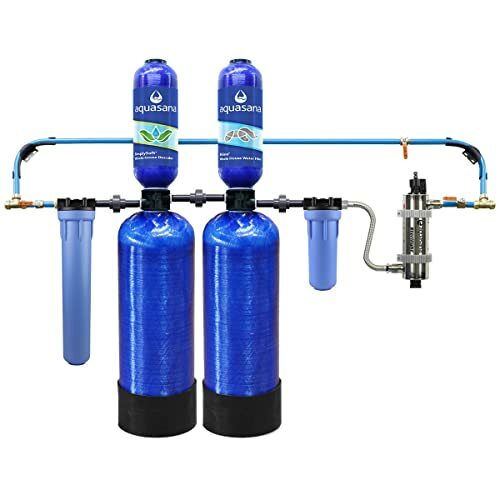 The feature that makes Aquasana Rhino one of the best water softeners for well water is its unique dual tank design, which increases well water contact time with contaminant grabbing media and prevents clogging or media channeling. The design has been tested and proven to remove 97% of chlorine for 500,000 gallons or 5 years. The softener uses KDF-85 to change soluble ferrous cations (positively-charged ions) into insoluble ferric hydroxide, which is then filtered out. With enough oxygen dissolved in the water, iron removal rates of 98% or better are common. It also contains high capacity Catalytic Carbon (CGAC) for oxidizing hydrogen sulfide. This will remove high levels of sulfur from well water. Fleck has been in the business for over 150 years, so it is no surprise when someone purchases product from them and are very satisfied as a result. They have great customer support that can be contacted by email, an online form, and even though the phone. The Fleck Iron Pro 2 Combination Water Softener is one of the best water softeners for well water that Fleck offers to the market. It’s not only designed to remove all kind of minerals that cause the well water to be hard, it’s also very efficient in removing iron and manganese. The smallest version of this water softener can handle 32,000 grains and removes iron up to 2-4 ppm range (1 ppm = 1 mg/L), hardness up to 50 GPG, and takes care of sediment, sand, rust and manganese. The largest can handle 80,000 grain and removes iron up to 8 ppm, with a hardness capacity of 85 gpg. With five different sizes available, you can easily find the best water softener for your well water usage needs.